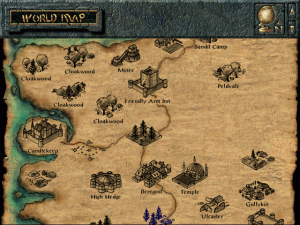 One can’t begin to explain how large and complex Baldur’s Gate is. In many ways, it’s the best tabletop to computer rendition of AD&D, and while a few measly pages can’t really do the game world much justice, some pointers and friendly nudges in the right direction might be useful to new players who might feel intimidated playing this RPG for the first time. This walkthrough will broadly guide you through from the start of the game to the bandit camp, helping you make smart decisions along the way. The journey of Gorion’s child shall begin at a citadel of learning. Start your quest in the outer courtyard of Candlekeep. Although the sheltering walls of the library fortress have bounded your world for years, it is finally time to move on. Gorion has asked you to meet him on the inner keep stairs, but the truly wise adventurer never passes up an opportunity for exploration and acquisition first. To begin, enter the Candlekeep Inn and chat with Winthrop the friendly tavernkeep. Purchase the best weapon and armor your meager budget will allow for now. Skip the shield, but don’t forget a helmet if your class will permit. And purchasing a batch of crossbow bolts will save you a return visit later (trust me). Outfit yourself, then look in the Inn’s northwest corner for a guy called Firebead Elvenhair. 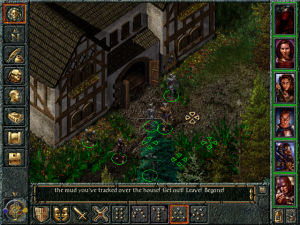 Chat with him, then leave the Inn and proceed around the outer keep in a clockwise manner. Also chat with any green-robed monk if you see one. Since the lessons you’ll learn here in Candlekeep are vital to your survival in the outside world, make you chat with everyone. Talk to Phlydia in the northwest corner of the town. Wander east until you see Dreppin the stablehand, and chat with him. Once he reveals the location of Phlydia’s book, retrieve it from the hay and return it to her. Tuck your reward away for later sale. Again, move east around the keep. An assassin waits for you in the priests’ quarters, and another lurks in the southern bunkhouse, but they are easily dispatched with your new armament. On the northwest side of town, spar with Jondalar for a bit of experience. If you attack him immediately and repeatedly, his hidden friend will not have time to shoot at you. Further south, Reevor will send you into a storehouse to kill rats. Take time out to search the place for gear and gold. Continuing south, you’ll meet Hull, a guardsman at the gate. Chat with him, then head southwest to the guardhouse. Not only can you get Hull’s sword and potion from his footlocker, but you’ll also be able to trade those crossbow bolts to the guards for a bit of gold. Return the sword, then ferry the potion to Dreppin. At some point during this procedure, you will probably run into the guard captain. In the southeast corner of the town is the building he wants you to visit. Stop in for a little practical battle training. Once you’re comfortable fighting with a group of allies, walk north again and enter the inner keep. Be nice to Imoen—she may seem a little annoying at first, but her unique skills will one day be an invaluable asset. Go north around the inner keep until you meet Tethtoril. Get the Identify scroll from him, and return it to Firebead in the Inn. Finally, after making certain you’ve looted every possible nook and cranny of the outer keep, seek out Gorion and start the main quest…. Mere hours from the walls of Candlekeep, Gorion shall fall to an armored mage, defending you with his final strength and urging you to flee the area. Fortunately, you are not entirely without direction. Two of Gorion’s friends await you at the Friendly Arm Inn, a short ways north on the great Coastal Highway. With Imoen by your side, return to the place of battle and search Gorion’s corpse. Take everything you find, and also search the defeated monsters. Then proceed southeast until you reach the main road and follow it eastward. Along the way, you may encounter a pair of rogue adventurers, seeking to join your small party for reasons of their own. Leave them and move on. In the next region, after chatting with Elminster, take the Coastal Highway north. Once you reach the Friendly Arm region, take the northeast fork of the road and proceed into the keep. The entrance to the Friendly Arm Inn itself is on the east side of the building, up a flight of stairs. Unfortunately, a relatively powerful assassin is waiting on those stairs, ready to chuck some very annoying spells as soon as he’s identified you. Fortunately, the guardsmen of the Friendly Arm keep dislike anyone who fails to help keep the peace, and will help you defeat him. Walk slowly along the southern wall of the Inn building. As soon as you see the stairs, stop. The guardsmen chat among themselves, so you should be able to locate them by sound. As soon as at least two of them are present near the stairs, run over that way and get as far up the staircase as you can before the assassin approaches you. The instant you’re finished chatting, book past him and enter the Inn. He won’t follow. In the northwest corner of the Inn’s main floor are Khalid and Jhaheira, Gorion’s old friends. Talk to them and allow them to join your party. Rest at the Inn, purchase enough equipment to make certain that everyone’s up for a good fight, and exit back to the stairs. Wonder of wonders, the assassin is still there, as are the guards who should now be moving towards him. Attack with everything you have, including Imoen’s wand if she doesn’t have a decent bow. With at least six attackers, he should fall fairly quickly. Loot his body, then continue east to visit the temple. Stock up on healing magic and get ready to hit the road again. Nashkell is quite a ways south, and you will need to pass through Beregost on your journey. If you would care to stack the odds a bit more in your favor, there is a helpful ranger on the north end of High Hedge, the region just west of Beregost. There are also plenty of skeletons and other nasties in the area, though, so make sure you’re well rested and prepared before you venture off to find Kivan the ranger. Once you leave Beregost, a fair amount of southbound walking will take you to the outskirts of Nashkell, and the beginning of your next great adventure. Make certain that all your friends are healed and take time to camp on the road. A nasty surprise awaits you in the Nashkell inn, and this will be your last opportunity to rest until you’ve dealt with the assassin. Fortunately, she is not particularly powerful, although she can be formidable if you arrive injured and tired. Once the assassin is dead, and you’ve rested again if necessary, walk southeast on the main road until you encounter the mayor. Chat with him to learn about the mines, and accept the mission to clear them out. If you have a bit of spare cash, travel east to the carnival region. 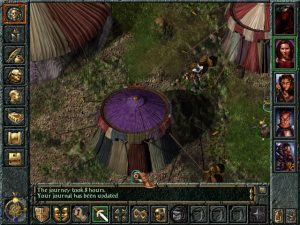 Near the cluster of small tents in the middle of the map, an unscrupulous man is selling a scroll of Stone to Flesh. 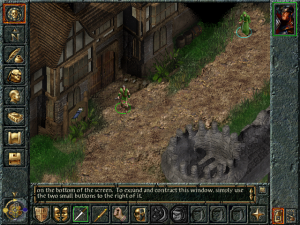 Branwen, a clerically-inclined lady, is standing petrified in the middle of the road. If you restore her to human life, she will be quite happy to join your party, and will make an excellent companion. Proceed to the mining region, and head for the northwest section of the map. 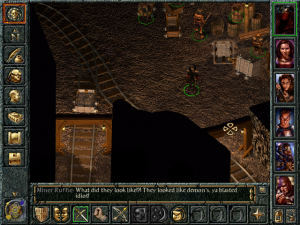 Chat with the mine’s hired guards, then ask Emerson for permission to enter. Once inside the mine, chat with the workers to get a better idea of recent events. After the first level, you may occasionally find a well-placed trap. One of the simplest ways around this is to have Imoen sneak ahead—preferably invisible, if you have a spare potion—and find the shortest route to the exit, disarming any traps along the way. Always be wary of ambushes, since this seems to be a favorite trick of the kobold hordes. On the fifth and final level, you will encounter a humanoid named Mulahey. Convince him that someone named Tazok sent you, and then dispatch him and his summoned guards. Because he definitely will be calling for reinforcements, make certain that your melee fighters are closest to the door and your ranged combatants are further into the room before you talk to Mulahey. Once he and his hordes are dead, search both his body and his trunk for helpful goodies and incriminating documents. Once you have the documents from Mulahey’s underground haven, retrace your steps to exit the mine. (A second exit does exist on the bottom level, but it is merely a one-way passage to a dangerous region.) If you encounter a mage called Xan who wishes to join your party, politely decline. He will not be of use to you. Back in Nashkell, return to the mayor and offer him Mulahey’s documents. This will earn you the gratitude of the town and a surprisingly large reward. A less pleasant surprise awaits you near the local inn – another assassin. Again, this killer is a spellcaster, so use Silence. Before you head for Beregost to confront Tazok’s lackey Tranzig, you’d do well to court the assistance of the Sword Coast’s most impressive fighter—Minsc (even though a certain rodent occupies one of his quick belt spots). You can find him near the guardhouse, looking for help in his quest to rescue a friend from gnolls. As she is an excellent spellcaster, you’ll want to have two open slots in your party roster. 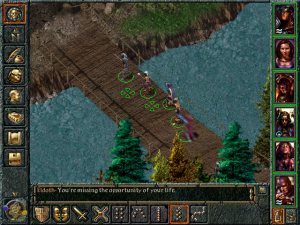 I suggest parting ways with Kivan the ranger and Branwen the cleric. Proceed to the furthest possible region in the southwest corner of the map. Bring along extra healing potions and other useful supplies. One important warning. If you return to town too many times before freeing Dynaheir, Minsc will turn on your party. His friend is in one of the pits at the top of the stony fortress (the one farthest to the right), so work your way up to the ramparts as directly as possible. Invite her to join the party, and head up north to Beregost. Tranzig, your quarry, has been staying on the upper floor of Feldepost’s Inn. Confront him, and brush off his threats. If he takes enough damage, he’ll surrender and tell you everything he knows. Offer to let him live. If you’re feeling particularly cruel, you may then kill him to get a few helpful items. Rest and restock your party, then proceed north to the newly revealed Bandit Camp. When you enter the Bandit Camp region, stay on the west side of the map and work your way north. This will allow you to enter the camp itself from an unexpected direction, and deal with a powerful member of the Black Talon while you’re still fresh and ready for battle. Once he and his nearby guards are dead, work your way slowly across the north end of the camp until you come to a cave. Enter and kill the prisoners inside. This cave will now be your base of operations in the camp—retreat here whenever you need to rest and heal. And thus ends this little walkthrough. The rest of the adventure will be up to you. Happy gaming.